Home/panel extenders/Is Walking at Work Too Noisy? That’s the question one poster at “OfficeWalkers” asks. 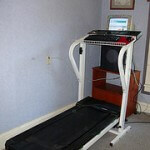 Laura wants to use a treadmill at work to get more fit. However, there’s the issue of noise to consider. Will the swooshing sound of the workout equipment disturb cubicle neighbors? He’s probably right. Some office environments and cultures are a lot more accepting of a little extra white noise than others. Of course, if you let coworkers take turns on the treadmill, more might be willing to put up with it. Increasing the height of cubicle walls to add more sound shielding is another way to make the office more treadmill friendly.